So, the big day is on the way and you are the happiest couple on earth! 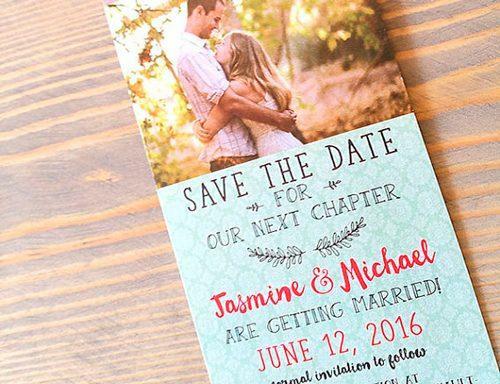 It’s time to think about save the date wording! If you want to increase the turnout, the earlier you send your save the date, the better. This is especially important if the wedding date is during the period when people are often away: any bank holiday or peak summer. The same applies to an overseas wedding: booking flights takes time. Guest should have time to request time off work or plan travel. First thing to do, when considering the task, is to take a look at some basics. Save the date samples can help a lot. We have prepared some great save the date examples for you to use! 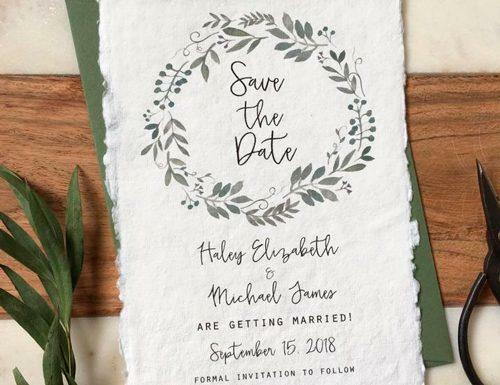 Sources: Love of Creating Design Co.
How to format save the dates? Use request language. The level of formality might change, but remember that politeness is important! Names. Your guests might not know your significant other at all. It is only natural to provide the information on who you are getting married to. You might use first, middle and second names for the more formal types, but first names only will do. Date. The most important part. You need to make sure your guests do not plan anything for the date. You can also include the day of the week. Location (just a city, leave the venue for the invitation). Even if you celebrate in your hometown, some of your guests will probably have to travel. Don’t forget to mention the city and state, and try to avoid any abbreviations. You definitely don’t want your guest to end up in the wrong city or state. This is especially important in case of a destination wedding. Invitation to follow – don’t forget to mention the forthcoming invitation. Though it is a mere formality, it is definitely an important one. 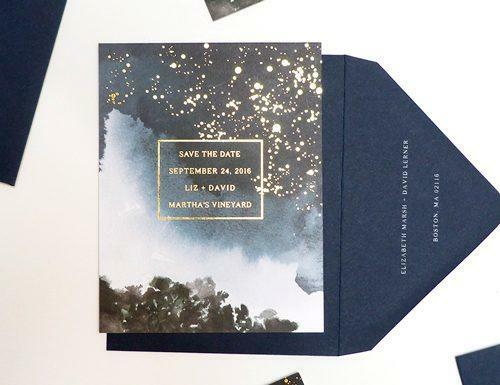 If you want a more formal style, try one of these examples of save the date cards. Traditionally, save the date cards are A5 or A6 sized cards. These contain only very basic but essential information about the wedding since you don’t really want to give too much away early on! Here are several other examples of a classical formal save the dates. Remember, that your save the date is the first impression your guests will have of your future wedding. Design and wording of save the dates are important. If you feel that formal save the dates sound too official, and you need more playful and flirty ones – try some of these funny save the date wording. You might add several creative features, like wedding quotes for friends. Remember, that a more casual wording requires a more relaxed design. In addition, a fun picture of the two of you can do the trick! Join us as we say ‘I do’! Save a place for us on your calendar! Hope you will be there to celebrate! You might also try to write some funny wedding wishes on the envelope to make your save the dates even more personal and humorous. However, remember, that the style of the card should match the overall style of the wedding. A formal wedding would require a formal Save the Date card with classic font to set the tone of the event. 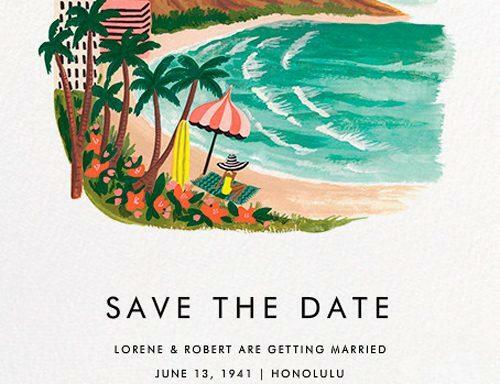 An informal wedding Save the Date might be bright, bold, and colorful. One special type of save the date is destination wedding save the date wording. While you are busy writing wedding vows, your guests will be planning their trip. After all, destination wedding requires taking time off work, saving money, arranging babysitting etc. All of these mean your save the dates need to be extra creative. In case of a destination wedding save the date is more of a pre-invitation than just a notice that you’re having a wedding. You should have a general timeline for the weekend’s events, from the welcome party and brunch to any group activities you’ve planned. And you should have already secured a room block at your hotel so guests can figure out which days to take off and reserve their hotel room. For instance, ask your guests what activities they would want! Whether it’s in your save the date or on your wedding website, provide a few options and ask guests to pick what they’d be interested in participating in so you can plan accordingly. Planning something particularly intimate or really remote? Ask guests to RSVP as part of your save the date, and use the invitation as more of a formality later on. And of course, be sure to provide all of the information on your wedding website, too! If you’re pressed for space, keep your save the date basic, and let guests know to head to your site for all of the travel specifics and a schedule of the weekend. We’re getting married by the sea! We’re taking a gamble of a lifetime. as we are going to tie the knot in Las Vegas, Nevada. We’re tying the knot in paradise. Also, apart from the wording, why don’t you think of some really creative ways to format your message? You might make your save the dates in form of custom designed mini message in a bottle. Or to add a playful touch by sending a postcard save the date. A picture of your exotic location will be a perfect background for this simple, yet perfect save the date. There are various designs that hint at the fact, that you decided to celebrate your special day away from home. Why don’t you try a ‘luggage tag’ or a ‘boarding pass’ destination wedding save the date? 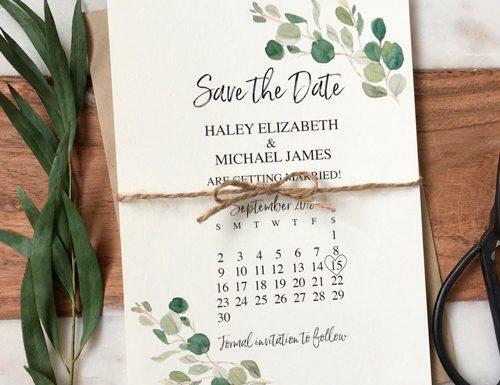 So, your save the dates are perfectly worded – how and when to send them? Of course, you could use traditional snail-mail. But our age of advanced technology offers more than one modern way to practice save the date word art. The most popular and common ways would be to share the news via e-mail or a text message. It would also help to save money on stationery and, most probably, a couple of trees as well. And don’t forget the old one verbal personal communication. Pick up the phone and dial the number – that will show your nearest and dearest you really care. Typically, the couple sends save the dates between six and eight months before the wedding. If it is a destination wedding, probably even more: about 9-12 months. In case of a save the date, there are several ways to spread the news that are definitely out of the box. There are more original media than paper. Why don’t you try various, more original, means to communicate the message? Unusual save the dates surely will make your future wedding more memorable, and leave your guests anticipating. And remember, your save the date should not only inform, but also reflect your inner selves and feelings for each other. Be creative!